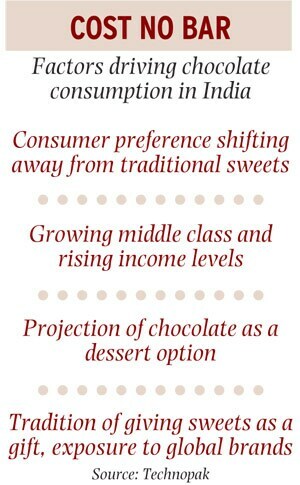 How Italian confectionery giant Ferrero created a market for premium chocolate in India. Almost two-and-a-half years ago, a handful of journalists visited a chocolate factory at Alba in Italy. The factory is owned by confectionery giant Ferrero Group, that clocked revenues of e7.8 billion - or $10.7 billion at current exchange rates - in the year ended August 2012. What was so special about the visit? It was the first media interaction in the history of the company founded in 1946. 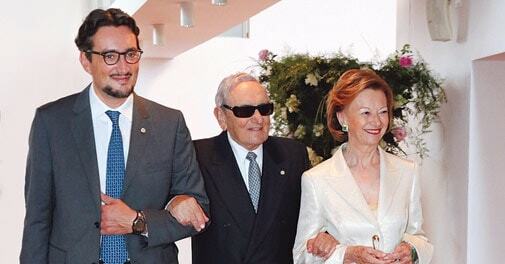 And even then its reclusive billionaire owner, Michele Ferrero, declined to be interviewed. No wonder, then, that Luigi Oddone, the India head of Ferrero, refused to be photographed when Business Today finally met with him after nearly two years of numerous requests for an interaction. "How can I project myself as the face of the company when my owners in Italy have always shied away from publicity," he says. The maker of Ferrero Rocher and Kinder Joy chocolates, Tic Tac mouth freshner and Nutella hazelnut spread was founded by Michele's parents, who first set up a pastry shop and then expanded it into a factory. But it was Michele who took the family-owned group global. Today, Michele is Italy's richest man and ranks 22nd in the Forbes list of global billionaires with a net worth of $26.5 billion. The company is now led by his son and CEO Giovanni. Ferrero entered India in 2004, when it set up a branch office in Chennai. At the time, India hardly had a market for premium chocolates that cost more than Rs 25. Since India is a price-sensitive country, most brands offer products at low prices in small packs. Market leader Cadbury has been selling its flagship brand, Dairy Milk, at an entry price of Rs 5 for over a decade now. That has changed today. Premium chocolates now make up about 27 per cent of the Rs 3,000-crore chocolate market in India, according to consultancy Technopak. 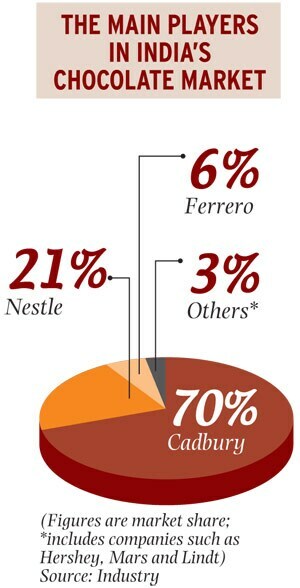 Besides Ferrero, several companies including Cadbury, Nestle, Mars, Hershey and Lindt compete in this segment. Cadbury - with its Celebrations, Bournville, Silk and Toblerone brands - is the market leader with more than 60 per cent share in the premium segment and 70 per cent overall, according to data provider Nielsen. Ferrero has garnered a six per cent share of the Indian chocolate market in just a decade. More importantly, it is credited with developing the premium segment. "Ferrero created a market for premium chocolates in India from scratch," says Devendra Chawla, CEO, Food Business, Future Group. Food Bazaar, Future Group's retail chain, is the largest customer of Ferrero India. Chawla says when Ferrero launched its Rocher chocolates, the only competing brand was Cadbury Celebrations, which was priced between Rs 100 and Rs 175 per box. "One has to give credit to them for launching their product at Rs 300 [per box of 12 chocolates] and making it work even at such a steep price point," he adds. So, how did Ferrero make it work? The company rolled out Rocher chocolates nationwide in 2007 and followed this up with Kinder Joy, an egg-shaped chocolate which comes with a toy for children, and Tic Tac in 2009. In October 2011, it started a factory at Baramati in Maharashtra. It invested Rs 230 crore to set up the factory and later pumped in an additional Rs 500 crore for expansion. 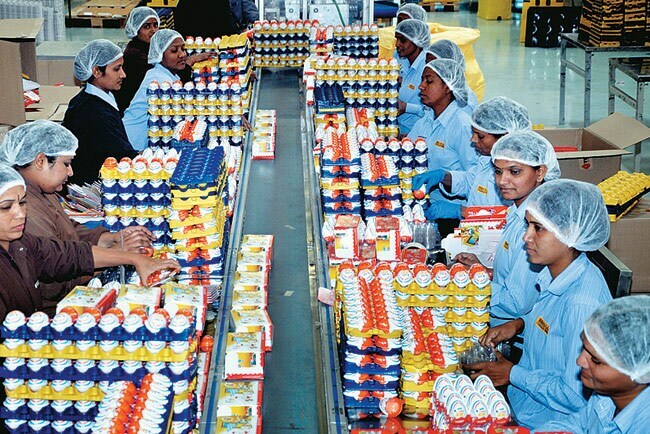 The factory makes one million Kinder Joy eggs and 20 million pallets of Tic Tac daily. Though the company still imports Rocher, it has made India its hub for Asia and exports half its local production. Ferrero India aims to close 2013/14 with revenues of about Rs 1,000 crore. Oddone says the company set up its branch office in Chennai because the southern region offered contrasting cultures. "People in Kerala are known to be open to experimenting while Tamil Nadu is more conservative. So, within a short distance we could see both the Indias, one which runs faster and the other which is traditional." Oddone says Ferrero sensed as early as 2004 that there was a set of consumers in India willing to pay Rs 300 for a box of chocolates. "We learnt that there is a space for premium products even in a country dominated by price-conscious consumers," he says. Ferrero did not hire any market research firm when it was test-marketing Rocher. Instead, it decided to go to the market on its own to understand the Indian consumer. "This helped us in two ways. Not only did we realise that Indians were open to buying an expensive box of chocolates, even if it was sold in a kirana store, we also realised early enough that consumers would buy expensive chocolates mostly during festivals when they generally gift sweets." Ferrero supplies Rocher to modern retail stores such as Food Bazaar round the year, but kirana stores get these chocolates mostly during festivals from October to March. During the summer months, Ferrero distributors don't usually allow kirana stores to stock more than three to four boxes because of a lack of refrigeration facilities. "We don't want to compromise on quality. It is better not to be there than give the consumer a stale product," says Oddone. Despite being available mostly during festivals, Rocher has captured 14 per cent share in the box chocolate category, according to Nielsen. Cadbury Celebrations is the category leader with over 50 per cent share. Chawla of Food Bazaar says Rocher's round shape and golden wrapping that give it the look of a laddoo have struck a chord with consumers not just in metros but also in smaller cities. Mohit Khattar, CEO of Godrej Nature's Basket, the food retail venture of the diversified Godrej Group, says Ferrero has made a premium offering like Rocher a mass-market product by selling it through kirana stores. "Not only has it opened up the market, it has also encouraged superpremium chocolate brands to look at India," he adds. Its growth comes despite a 30 per cent import duty on chocolate. Cadbury, for instance, launched its Silk brand in 2010 and Toblerone from its parent Mondelez's global portfolio in 2012. Nestle recently launched its premium brand Alpino at Rs 30 a piece for round chocolates that look like Ferrero Rocher. Although both Cadbury and Nestle sell premium brands, they derive a large share of their revenue from mass-market products. But Ferrero has no such plans. It does not even plan to make cheaper variants of Tic Tac and Kinder Joy. Tic Tac is priced at Rs 10 while most mouthfreshener candies cost 50 paise. Kinder Joy, priced at Rs 30, is pitched as a healthy product that contains more milk than cocoa so that mothers prefer it for their children. "We can't offer a product like this at a low price," says Oddone. The plan, he says, is to sell Tic Tac and Kinder Joy at 1.1 million retail stores in the next two to three years, up from 38,000 now. Rocher, however, won't be sold in all the 1.1 million stores due to lack of storage facilities. Ferrero also has no immediate plan to bring more products to India from its global portfolio that includes liqueur-filled chocolates and chocolate beverages. "Transporting several of our products such as liqueur-filled chocolates could be a logistical nightmare. Also, weather conditions here are not suitable to sell them in India," says Oddone. Not everyone agrees with this plan. "Even if their strategy is to target discerning consumers, a wider portfolio could work to their advantage," says Khattar of Godrej Nature's Basket. Chawla of Future Group says Ferrero, especially with Rocher, focuses mostly on the gift segment. But Rocher is not the only gift option now. "Today, even premium pastas, cookies and olive oil are becoming sought-after gift options," he says. That's a point Ferrero must keep in mind.